Please note: This is a bespoke product and a full assessment must be arranged after purchasing. Excellent indoor manoeuvrability with great outdoor performance. The Quickie Salsa M HD provides many users with the ideal balance between indoor manoeuvrability and outdoor performance. Go anywhere in confidence with the Salsa M HD, now uprated to a maximum user weight of 160kg, it’s stronger than ever for outdoor performance, and new adjustable rehab seating system. The Salsa M HD’s MWD base provides excellent turning indoors, especially important for larger seat sizes. Also with excellent forward and rearward stability, thanks to the Salsa M‘s proven anti-pitch system. ‘HD’ is only part of the story! The Salsa M HD features the same rehab seating as the Quickie Jive – our flagship premium powerchair. This rehab seat meets a higher level of clinical needs than the standard Salsa seat, as well as offering increased adjustments and a wider range of options, like 50° tilt for effective pressure relief. The Quickie rehab seat delivers the perfect fit, improves seated posture and offers increased comfort. The Quickie Salsa M HD has a new 50° tilt, which is clinically proven to provide greater pressure relief than a standard 30° tilt. The Salsa M HD has a new anti shear backrest, that achieves angles of -10° to 40°. 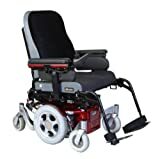 The backrest articulates as it reclines, reduciing shear and maintains body positioning. It keeps positioning the same over the whole recline range when using headrests and thorassic laterals. The JAY Comfort backrest is available in shallow contour, deep contour active or deep contour passive. You can choose from a choice of Comfort cushions or seat boards.